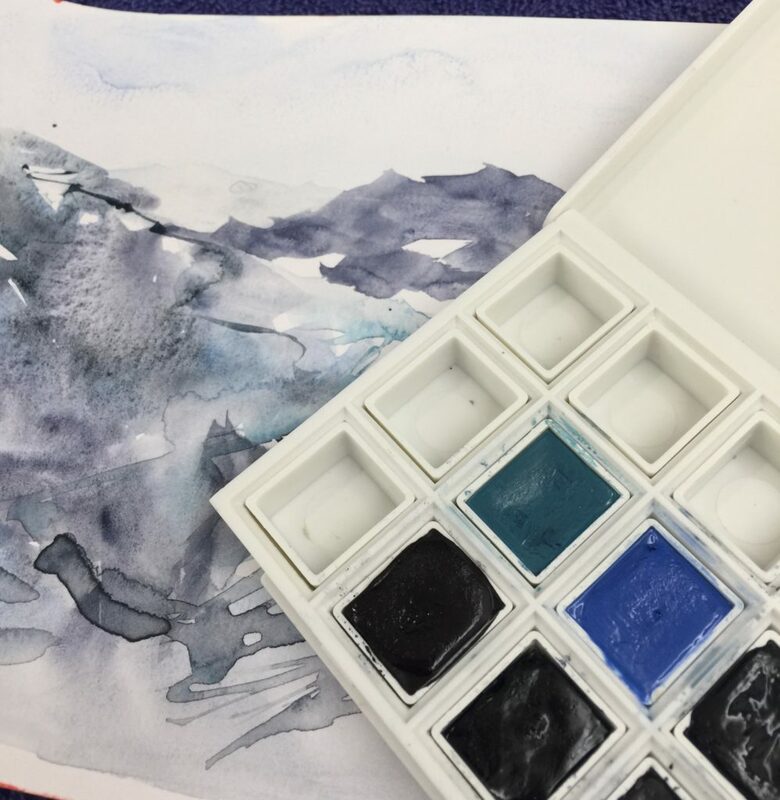 Once I discovered tube watercolours, I really battled with using pan paints – but the Daniel Smith Watercolour half pan set has changed my mind. I was thrilled to receive a set from Premium Art Brands a couple of months ago. The Daniel Smith watercolour half pan set come in three different colour combinations. When I saw that I had received the blues set I did a little happy dance. 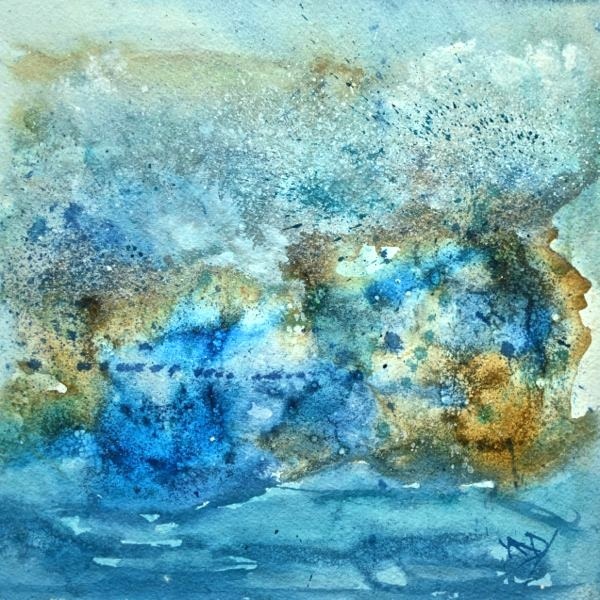 I’ve always loved blues and they appear in just about every one of my paintings. I was planning to use this set on my travels in February, but an accident stopped me painting for about a month and I’m just getting my painting mojo back now. 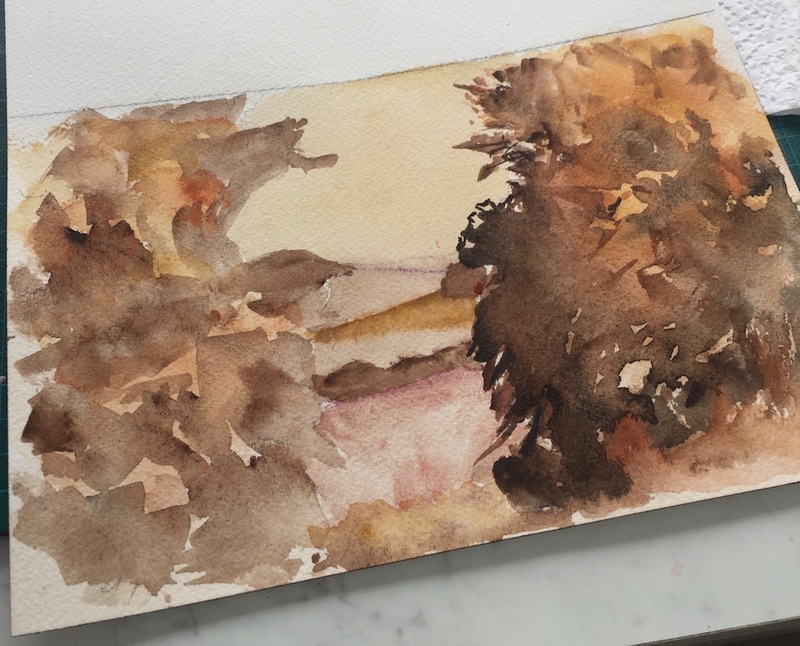 Playing with my new half pan set was a nice way to get back into the swing of watercolours. This weekend I put my Daniel Smith half pan set to the test in earnest. 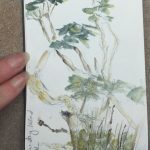 I spent half a day in my studio painting small watercolours for charity. I’ll be posting the results to my Instagram account this week. Why the Daniel Smith half pan set has changed my view. The key is in the fact that they are hand poured which basically means they’re tube paint in pans. That means all the gorgeous juicy paint consistency and intensity of tube colour. I also love the option of being able to select my own colour palette. In the past I have made a hack using little plastic pill boxes and a pencil case. It worked, but it was bigger than I wanted, pretty messy, and fiddly to use. The Daniel Smith set feels like everything I was trying to achieve with my pencil case hack, but better and in a very well conceived design. This is how the pan set arrives – with six lovely colours in the centre and nine spaces for your own selection of tube paints. So what colours did I choose? You can see the original six blues in the middle: Sleeping Beauty Turquoise, Cerulean and Lunar Blue in the top row of blues. Then Indigo, Sodalite Genuine and Payne’s Blue Gray in the row below. My additions from bottom left moving up and to the right are: Undersea Green, Shadow Violet, Burnt Umber, Quinacridone Gold, Aureolin, Sepia, Quinacridone Burnt Orange, Transparent Pyrrole Orange and Quinacridone Coral. I’ve just put a small amount in some of these as I may adjust this set slightly once I’ve used it for a while. Once I am sure this range will work, I’ll be filling those pans! 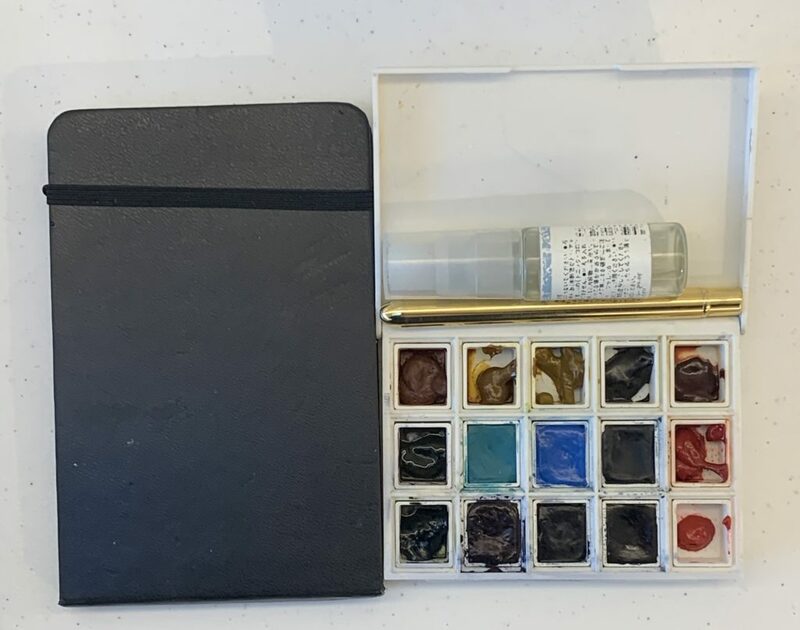 My new watercolour travel kit: Daniel Smith half pan set, moleskine A6 watercolour sketch book, travel brush and small water spray bottle. Pan size – bigger than most others so you can give your tubes a generous squeeze when you’re filling your pans. Its hard to find many down sides, but I wonder if an extra 3 pans would make it even more useful while still keeping the size down? It would still be no bigger than my A6 moleskine. 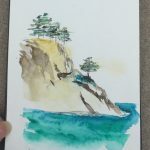 This post is not a sponsored blog for Daniel Smith watercolour or Premium Art Brands. 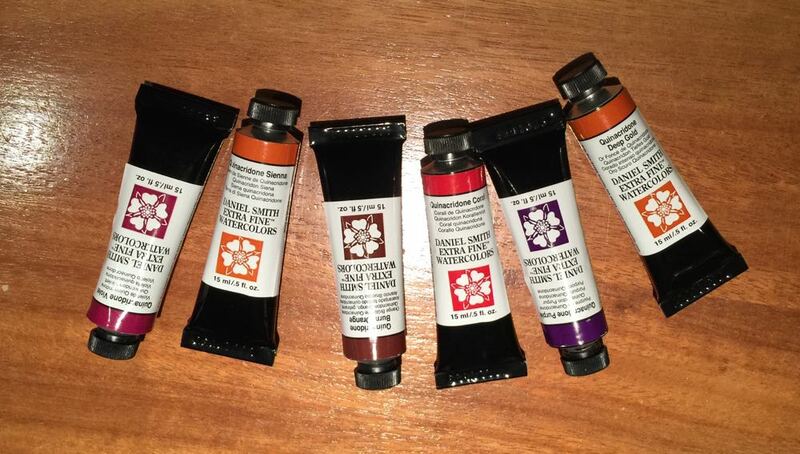 This is just my personal view of the Daniel Smith watercolour half pan set. 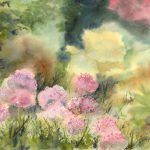 Layering watercolour (glazing) is a great way to add depth to a painting. But it needs to be done with confidence and careful consideration. If you use the wrong colours, the end result is flat. If your brushstrokes are not delicate enough, you risk muddying the painting. There’s a particular bench at Wandlebury Country Park that provides a wonderful view all the way to the horizon. You just need to know where to look between the rows of tall trees. 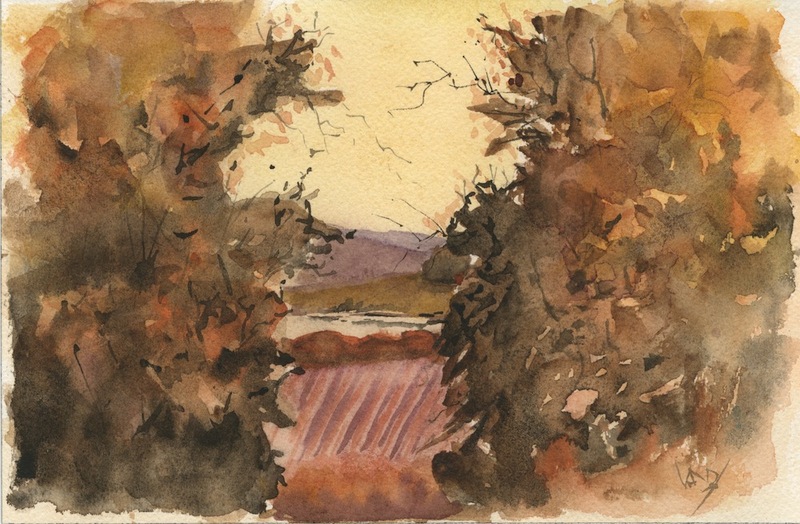 Last October, in the midst of autumns most incandescent glow, I spent a day painting up on the rise at Wandlebury. Between the trees the fields create a patchwork of textures and colours, framed by the ragged curtain of branches on either side. The light was changing quickly so I used a series of mid tone washes to block out the different levels of the view. 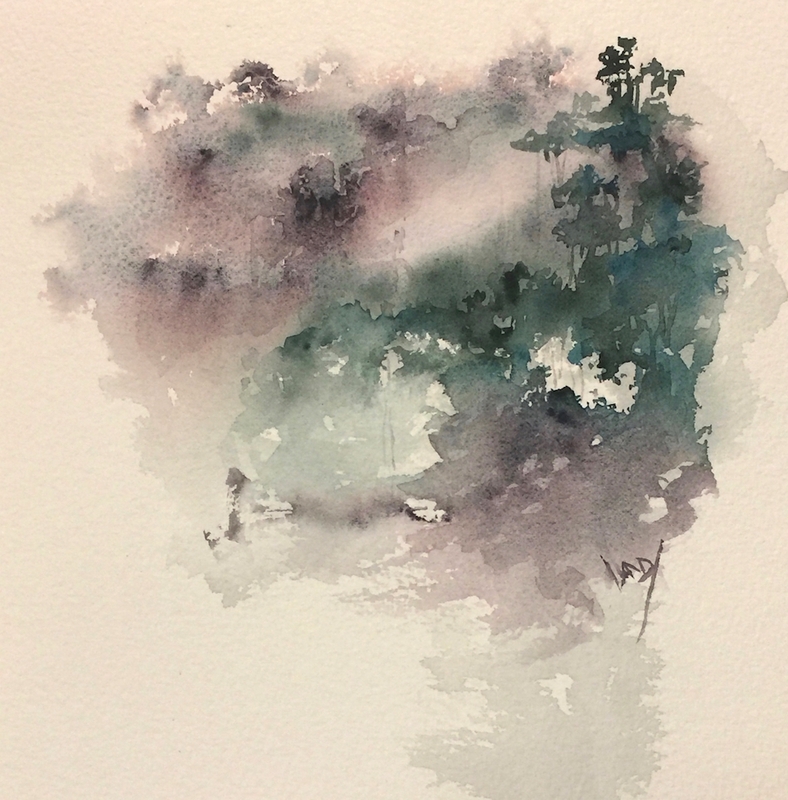 A three-colour scumbly wash over the tree areas produced a basic sense of the branch sections without adding any definition or much tonal value (left hand tree). 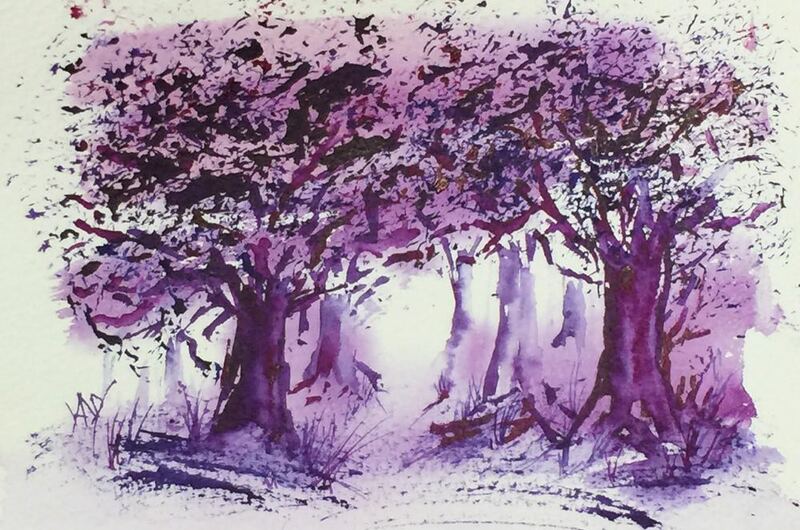 My next step in layering watercolour was to add wash of clear water on the right hand tree and then drop in the same three colours in greater intensity, allowing them to blend and granulate. I used this to start defining branch shapes and areas of the tree that would be in shadow. The fields are the area of interest in the painting so they are painted with more definition. 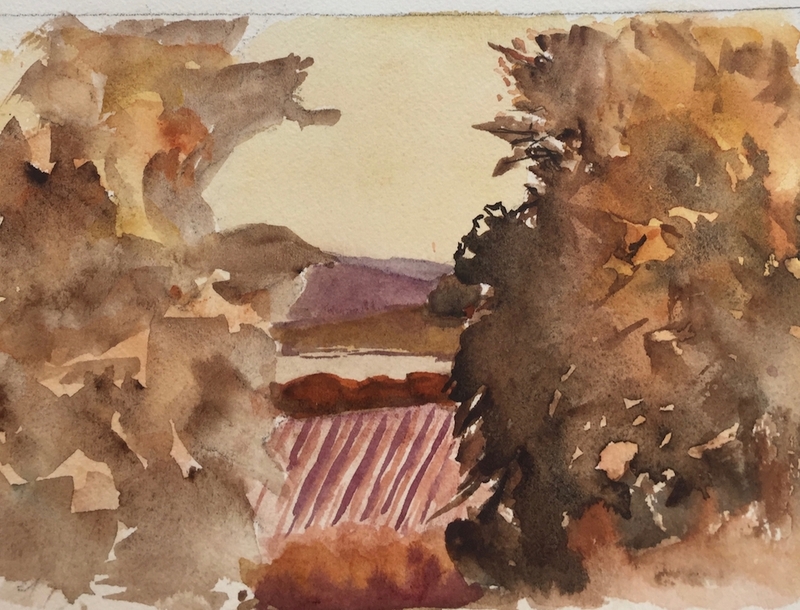 Layering watercolour here helps you to create some clearly texturing in the middle ground fields and in the foreground hedge. The final step was to add a glaze to the left hand tree. Once the painting was well dried, I used a sword brush tip to added branches in the trees. I decided to knock back the colour at the far end of the tree as it receded. You can see the final painting in the first picture of the post. Through the Gap. (See first image in the post). An autumn landscape painted from an underpainting done plein air at Wandlebury Park. 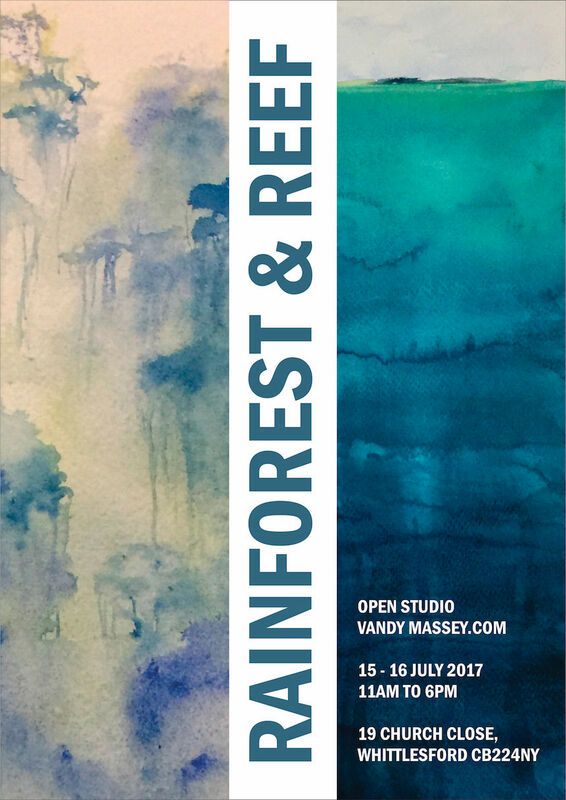 Open Studio Rainforest Reef! Its all about to happen. I’m heading home with a collection of watercolours and a few experimental abstract acrylics in my suitcase. I’ve had the most amazing two months of new places, new experiences and new paintings. We’ve travelled through Bangkok, Siem Reap in Cambodia, Sydney, Queensland (Mission Beach and Airlie Beach), Melbourne and finally Singapore. I am sitting beside the swimming pool in the heat on the 6th floor of our hotel in Singapore as I write. This evening we board our flight back home and I am simultaneously sad that my trip is at an end, and pleased to be going home. I can’t wait to see my sons and sleep in my own bed. I am itching to get back into my studio and get started preparing for next weekend’s open studio. 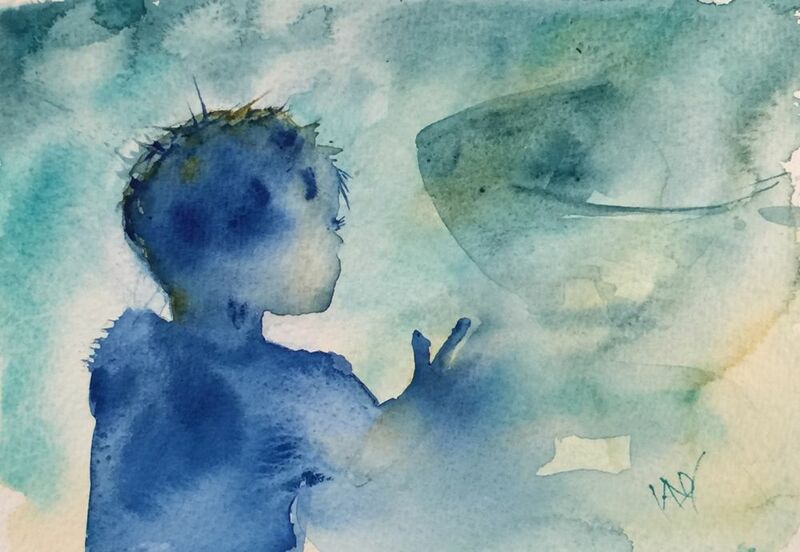 One of the best aspects of watercolour is their portability. Paintings dry fast and you don’t need a lot of kit (although I must admit I brought along far more than I needed). 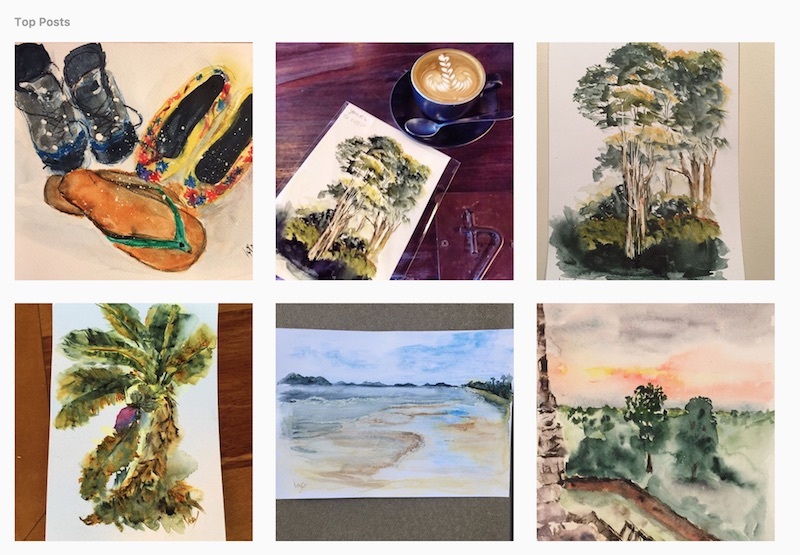 Before I left, I planned to paint a series of 20 x 20 watercolours for an open studio. Paper was cut to size, frames were sourced and set up ready to be ordered for my return. I wasn’t sure how many paintings I would manage to do so I couldn’t pre-order. Once I got to Queensland, I was entranced by the rainforest most of all. I’ve always loved trees. Ever since I was able to climb my first tree I have enjoyed their sheer scale, their majesty and their individuality. 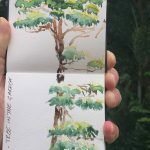 So, right now, there are more rainforest paintings than reef paintings – although I do have a lot more ideas for reef paintings that will no doubt emerge in time. My surprise discover on this trip was the fabulous art centre at Mission Beach. 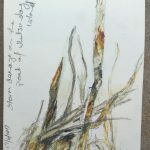 Where I was able to join a workshop on Abstracting the Landscape with Australian artist, Glenda Charles. The weekend was inspiring, terrifying and energising. I will have the two works I completed on that weekend available for Open Studio visitors to see. If you can’t make it to the Open Studio, I will be posting more about each of those two paintings when I have had time to scan all my work. Thank you for following my creative journey. I really appreciate the fact that you’re still reading after all this time. If you know anyone else who might enjoy my ramblings, please feel free to share this blog. I would be very grateful. More back in the UK. There’s an emerging digital watercolour sketchbook of my current trip. 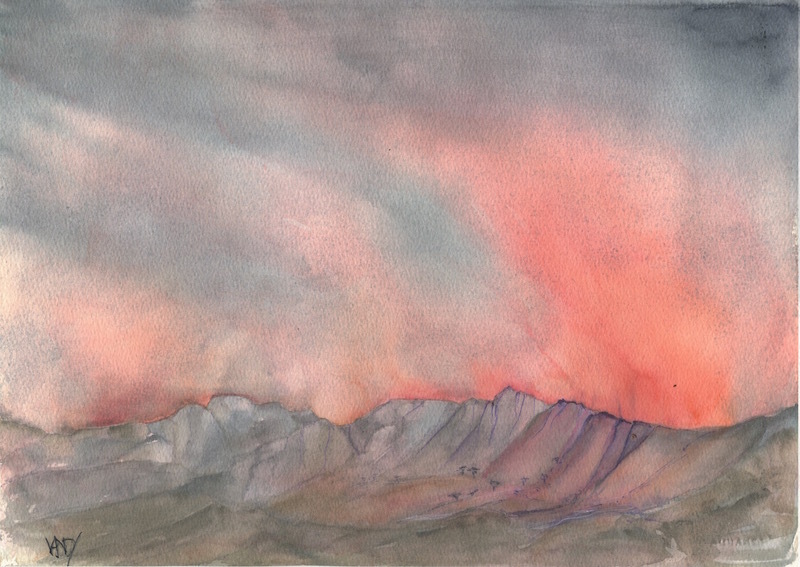 I love travelling and try to go somewhere every year – it inspires my painting. Right now I’m a long way from home, travelling in Queensland, Australia exploring Rainforests and Reefs. We came via Bangkok and Siem Reap in Cambodia because there were things to be seen along the way. Travel is such a cornerstone of my painting, I decided to make the most of it on this trip and create a digital journal along the way. Rather than keeping a daily sketchbook, I’ve painted an A5 sketch each day. Each one is then photographed it so I have a record and finally, left it in a public place for someone to find and keep. So far I’ve painted 43 and I hope to make it a total of 60 before I get home. Each image gets put on Instagram and in a Facebook album with the tag #ArtAustTrailAsia. So far the watercolour sketches have been well received. I mainly leave the paintings without telling anyone, and let them be discovered later. Often I’ve been on a walk, leaving the painting on a table at the beginning of the trail. Its always gone by the time I get back. A few people have left messages on Facebook or Instagram to say they’ve got a painting and to let me know where the painting landed up. The last few days I’ve been painting on a sailing boat with 22 other passengers. By the last day people were watching the emerging watercolour and asking if they could have the next painting. This was very good for my plein air painting. I’m normally too self conscious to paint in public and hate being watched as I work. But this trip has helped enormously and I’ve become much more relaxed about painting when other people are around me. What’s helped you paint in public? It can be a daunting prospect. I’m thrilled to have had two paintings accepted for the Babylon Arts Summer Open Exhibition. 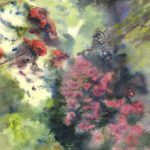 Rhododendrons in the Garden and Alliums in the Garden will be on show at the Babylon Gallery in Ely. The exhibition runs from July 29th to August 28th and will feature the work of 40 artists. The gallery is a lovely venue right on the river bank and its well worth a day out of boat watching, art viewing and some good places to eat lunch. 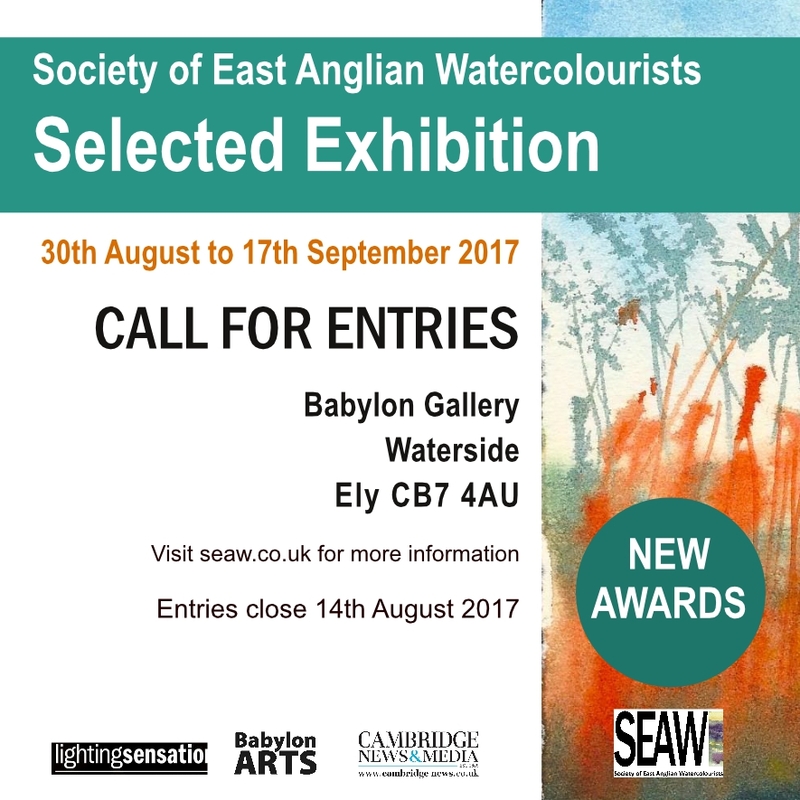 Just over a year ago I was honoured to be offered (and accept) the role of Chair of the Society of East Anglian Watercolourists. The society has for many years benefitted in various ways from links with the Royal Watercolour Society and the Royal Institute of Painters in Water Colours. It’s been an exciting year of working with a committee of extremely talented artists to bring in some new initiatives for the society’s 70 members. In the context of my art life this is what has been keeping me busy. I have two years left of my term so expect blogging to be sporadic. African Wild Dogs, otherwise known as Painted Wolves are endangered. They are small sociable canines, native to Sub-Saharan Africa. Their habitat is being destroyed and there are now fewer than 6000 Painted Wolves living in the wild. Jeremy Borg, CEO of South African wine brand, Painted Wolf Wines is on a mission. Today he started an epic journey on two wheels from Cornwall to Scotland. Along the way there will be wine tasting events and an art auction. Jeremy’s progress can be followed on the Painted Wolf Facebook page. Jeremy’s Top Dog Trek will raise finds for the conservation charity, Tusk in three ways: Donations, Jeremy’s ride sponsorship, and an amazing online Art Auction which opened at noon today and will continue for the duration of Jeremy’s ride. Bidding will close on 30th June. I’m very proud to be one of a group of artists who have donated works to this Art Auction. 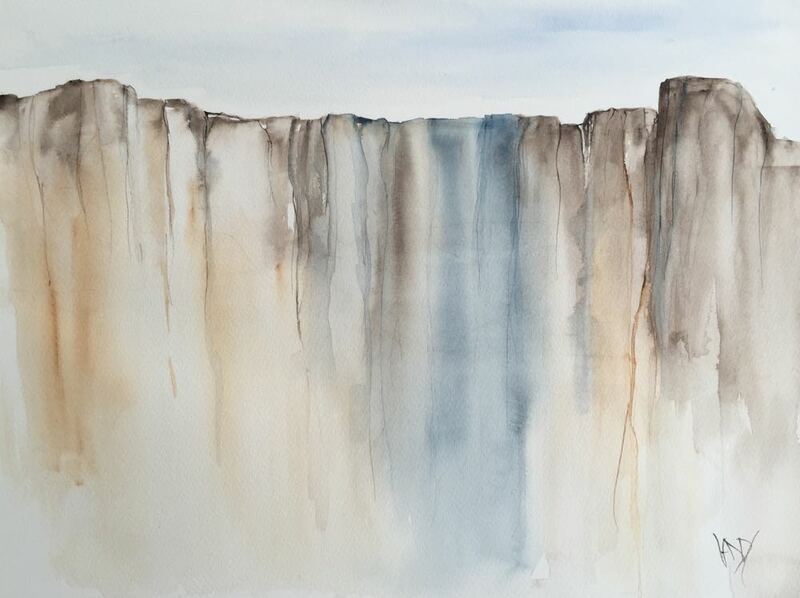 The two artworks I have donated were painted this year in the Drakensberg. Each one is a hand-detailed giclée print. 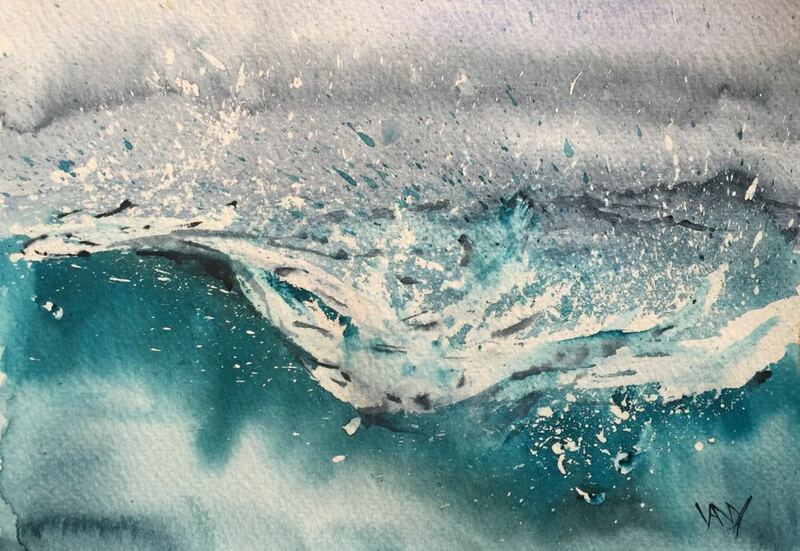 The original painting in watercolour is reproduced as a limited edition of 25 prints. Then each one has additional watercolour and ink detail, making it a unique piece of art. Bidding for a piece of artwork is easy. A simple online form must be completed to register. Thereafter, simply place your bid in a comment on the artwork page. Come back from time to time and check the current bid because the highest bidder on 30th June will be the owner of the piece of art. The Painted Wolves auction art works include original watercolours, acrylics, hand detailed giclee prints, photographs and sculptures. The first 3 bids were received within 5 minutes of the auction opening and artworks will be on display at a number of events along the route. If you’d like to have a look at all the artwork, you could look at the auction website (where bids can be made), or download the full catalogue pdf. For the past three weeks I’ve been painting South Africa. I’ve managed to get my brushes out a few times on this trip – each time the result has been very different. Every on of my South African journeys invariably involves Cape Town for work, and Johannesburg to visit my family. Both of those are special times for me: Cape Town because it is a stunningly beautiful city and I get to catch up with people whose company I really enjoy. Johannesburg because it’s where I grew up and there are loved ones there who I will always miss. Every chance I get to see them is special. We feel privileged to be able to introduce UK friends to this beautiful country from time to time. This year, Hayley and Simon joined us in a meander through the Drakensberg and the Natal Midlands so the men in the party indulge their fascination with military history and take a Battlefield Tour (Anglo Boer War). Our Drakensberg time was spent at the wonderful Montusi Mountain Lodge. We had four days of being utterly spoiled with wonderful food, fantastic scenery and staff who could not have been more friendly. Every single person at Montusi went out of their way to make our time there very special. We hiked, we ate, we laughed, we rode and we fell in love with the place. With two photographers in the group, I’ve got more than enough reference photos to ensure there will be more paintings of the Drakensberg from our Montusi days. On our hikes I noticed the wonderful display of colours in the grasses and particularly their seed heads . Anyone who has seen my mountain paintings will know that I am drawn to the majesty of towering peaks and the scale of big landscapes. 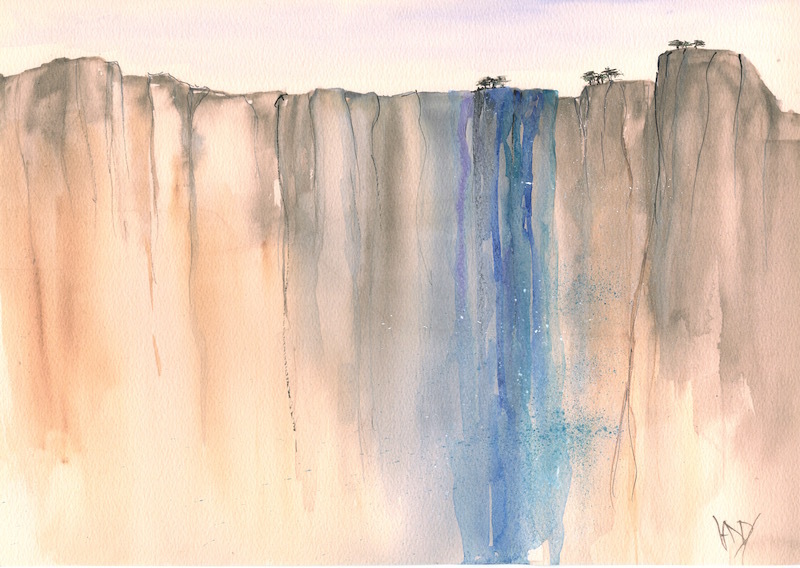 The Drakensberg is a place I can just feed my visual senses with images and ideas for painting. We’ve moved on to our final stop on this trip: Glen Ormond in the Midlands. On our first evening here it was clear that this week would hold as many great surprises as every leg of this trip has already delivered. 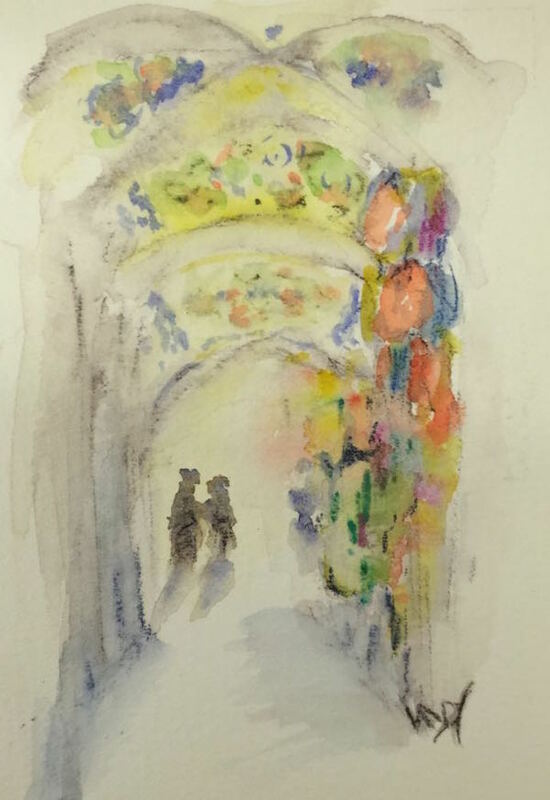 Last weekends colours and images have stayed with me and are reflected in more Istanbul watercolours this week (at least influenced by something from Istanbul if not a painting of Istanbul itself. The sights, smells and sounds of the city are more than memorable. The streets are filled wit vendors – of hot roast chestnuts and freshly squeezed juices (orange, grapefruit and pomegranate). Seagulls by the thousand shriek incessantly as they follow the ferries, looking for offerings from commuters. Beautiful sunsets across the water, silhouetting the towers and minarets of the mosques and the museums. And then there’s the intense (almost to the point of sensory overload) sights and sounds of the markets, the historic buildings, and the interiors of the palace. Blue is the dominant colour of the wall decorations. Ancient turquoise tiles, beautifully hand painted adorn vast areas of wall space in the Topkai Palace, the Blue Mosque and Ayasofya. I had the urge to paint in Turquoise this week. Lori always says that the colours you wear influence the colours you paint. This may be because you see them all the time while you’re wearing them. It’s certainly true that turquoise tones and teals are my favourite colours. I wear them a lot and they often feature in my paintings. Watching the Ray is part of my Wash a Week Challenge for this week, and will be making an appearance on Running With Brushes very soon. The sunsets over the Bosphorus are wonderful. Clouds waft across orange and pink skies revealing the many towers and minarets across the city silhouetted elegantly in windows of colour. 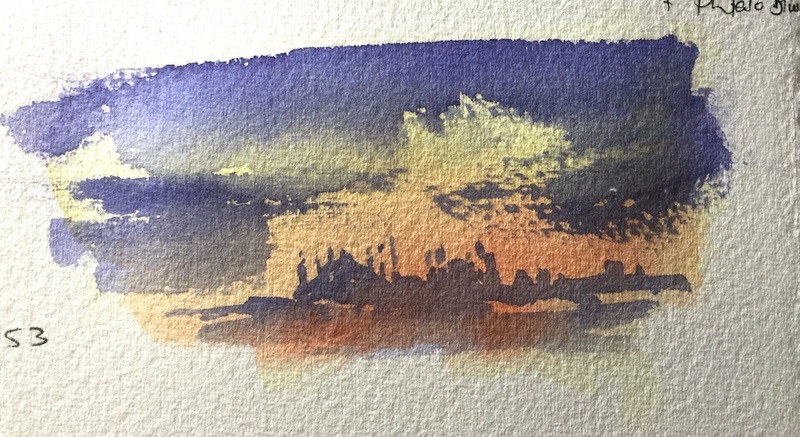 A little sketch in my colour journal captures the image and will always remind me of a ferry ride across the water, looking back towards the old city at sunset. I’ve continued gradually sorting through paintings and refreshing my Artfinder portfolio. It has been sorely neglected and I find there are many paintings on my walls which haven’t yet found themselves onto the Artfinder page. The update will continue over the next few weeks. Outeniqua Mountain Mist was painted from the platform of a treehouse as I looked out over the mountain range in the distance. Rain and Spray is exactly what it says on the can – a study of water in various states. Specifically, water in motion as rain and as ocean spray. This has been a weekend of Istanbul Art for me. I love travelling and these days, new places are quite often also a source of new visual inspiration. This was absolutely the case with Istanbul. This is a city with so many facets. To start with, it spans two continents. We are staying in Eastern Europe, and last night, popped across the river to have supper – in Asia. I love the idea that this city has one half in Europe and the other in Asia. And the two sections couldn’t be more different in feel. The European side houses the old city and features the historic buildings we all know about. The Asian side is buzzy and modern and features rows of contemporary pavement restaurants and English language schools. Both side are fun – in a very different way. We’ve had so many places to see in only a few days so my own art has consisted of a few sketches. There will be more when I get home though. My head is filled with image and ideas. The Grand Bazaar is worth a visit – but expect to be constantly asked to come and look at goods. Every shop seems to employ someone to stand at the door and entice customers in – and they can be quite persistent. Its not so surprising when you realise that there are around 5000 (Yes, five thousand. That’s not a typo) shops in the bazaar and many of them sell the same sort of goods. The shops are sometimes no more than stalls, but every one is crammed with wares. This covered market dates back to 1461 and the vaulted ceilings are all painted with complex ancient patterns in yellow, green, blue and red. The Blue Mosque and the Ayasofia are both on everyone’s ‘must see when visiting Istanbul’ lists. And now that I’ve seen them, I can understand why. We saw both on one day and my preferred one of the two was the Ayasofia, simply because it has such a fascinating and complex history which shows in the building. 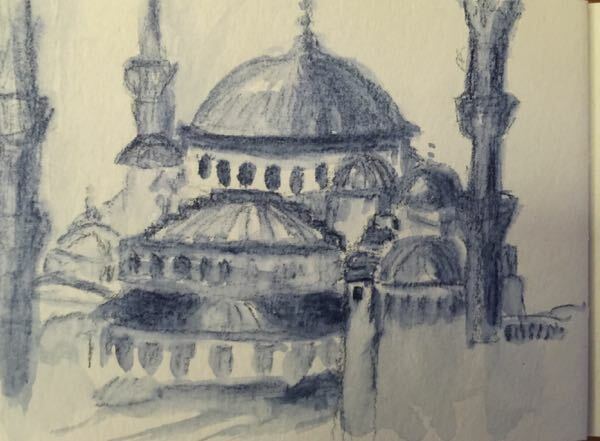 In a busy day, I sat on the steps for 10 minutes after visiting these two impressive buildings, and tried to capture the imposing feel of the Blue Mosque in my sketchbook. More about Istanbul art in a future post. This is Week 5 of the Wash a Week Challenge and I’m exploring Quinacridone Purple and along with a different type of sponge for painting. I’ve fallen in love with my watercolour journal and I’d like to introduce you to it. Two years ago I was given a wonderful bound book of heavy weight Arches watercolour paper. It was so beautiful that it took a month before I could pluck up the courage to put brush to paper. And even after I had made my virgin mark on page one, I was still so worried about messing it up, that I was afraid to paint in it. Now the Wash a Week Challenge is well and truly up and running (I’ve just published my second post) and I think I’ve found its purpose in life. 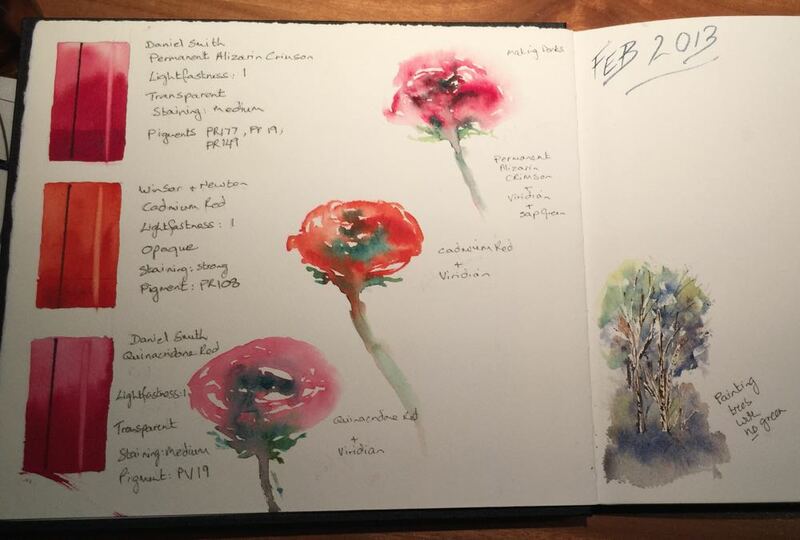 My beautifully bound book as become my watercolour journal. 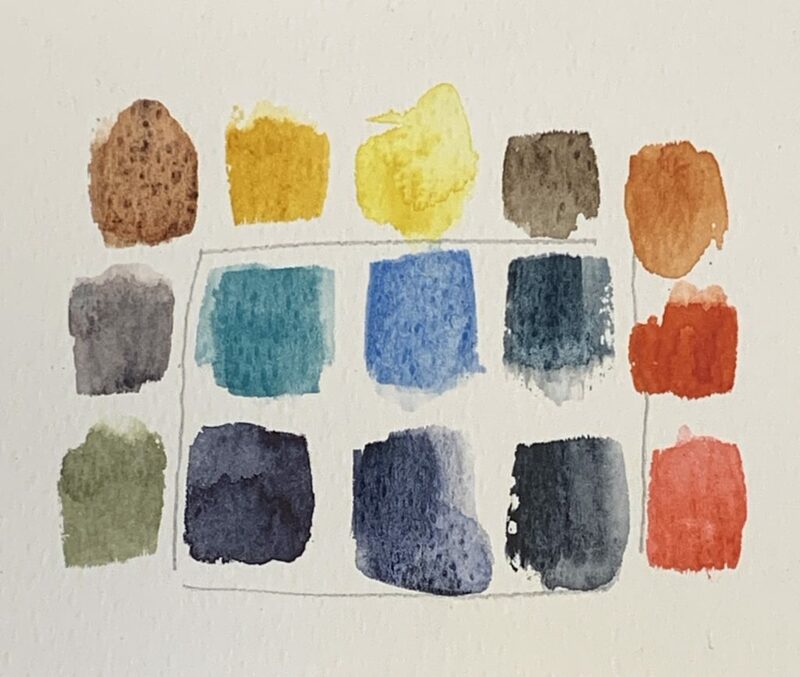 In no particular order, each week in the Wash a Week Challenge, I will be exploring colours I find useful or exciting, or those I want to learn about. And from time to time, I will share the journal’s progress. If you want to see snippets of the journal’s contents, you’ll see how it’s being used in my week by week posts. 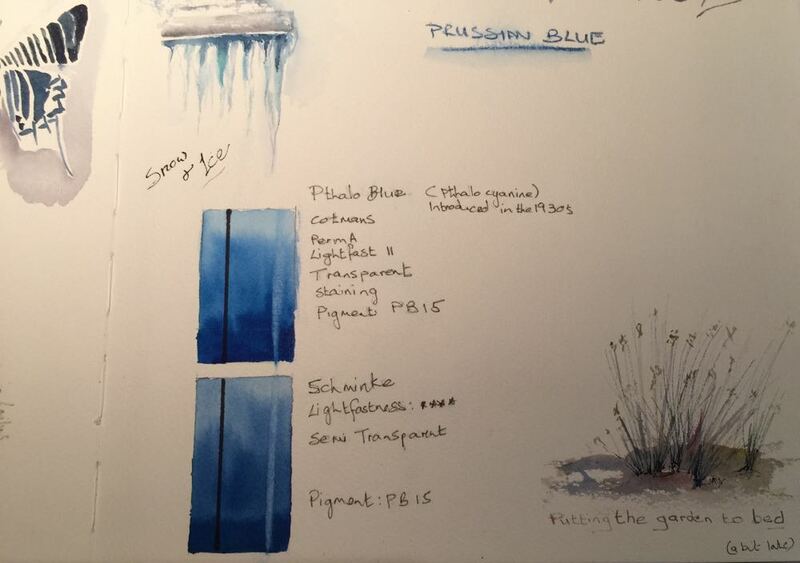 Pages combine specific colour studies and references, with little sketches. And in some instances, just an opportunity to observe and record shapes, colours and tonal values. In other news this week – I found watercolour treasure in my local art supply shop this week. I’ll be covering the Quinacridone family of colours. I’ve always loved Quinacridone Gold and when I discovered the Daniel Smith range of watercolours in the shop, the opportunity to fill up my palette with most of the rest of the range was just too much to resist. Exploring them all is bound to be good fun. Tomorrow I’ll be heading down to London for my first work meetings of the year. Perfect opportunity for a meeting with Doug Shaw at The Mall Galleries where the Artists and Illustrators Artist of the Year show is on starting tomorrow. I’m back from my trip and have just completed some another piece of Belle Île Orchard art. When we arrived on Belle Île the first thing that struck me was the glorious sunset. The following morning, I noticed the field across the road that was filled with meadow flowers. This is where the material came from when we started painting flowers from a French field. They were quite literally picked from the field a few minutes before we sat down to paint. There were other subjects to paint during the week, some of which I will come back to. We saw sea, rocks, lighthouses, fabulously coloured houses and so much more. But the Belle Île Orchard art subject matter really captivated me. 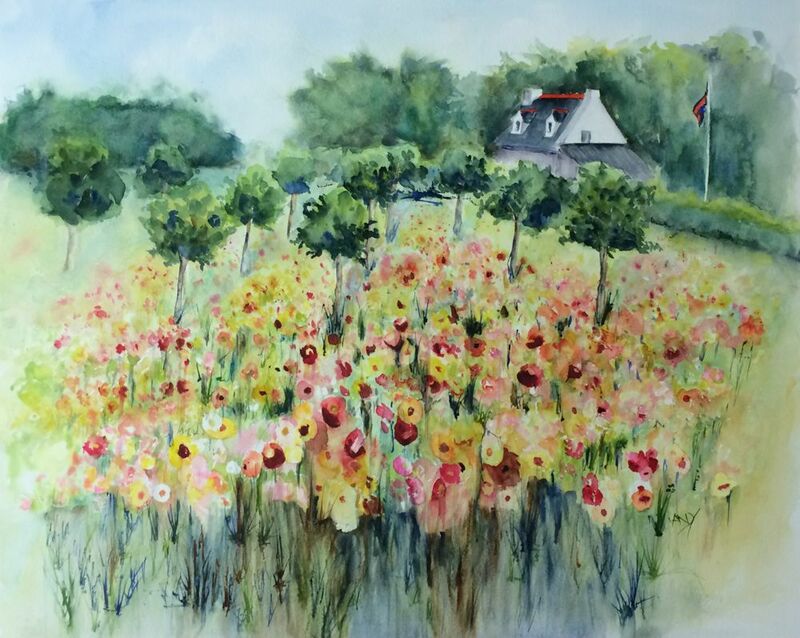 The field with it’s flowers seemed to epitomise the name of the place, and as the sunflowers and cosmos blossoms waved gently under the island sun, they seemed to invite more painting time. 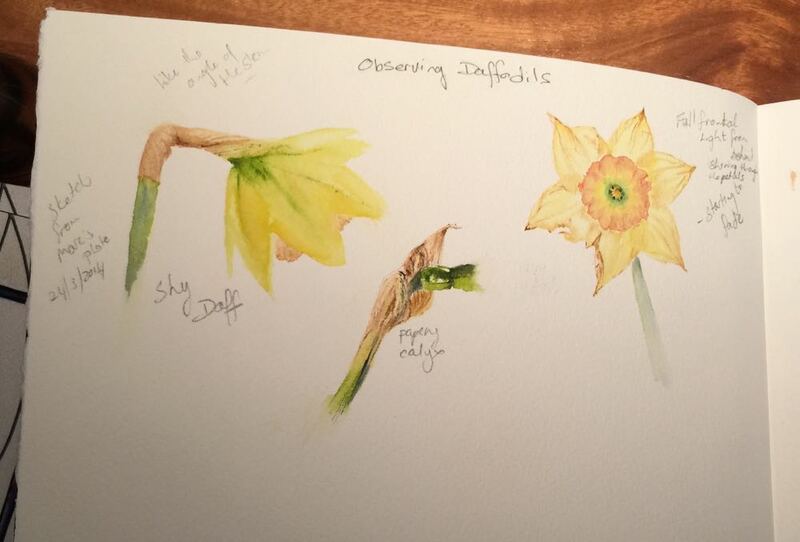 So I conceded and painted more flowers – just for now. The rest will come later. There’s a fascinating juxtaposition in this painting between the loose randomness of the meadow full of flowers, and the tidy, conforming lines of the Brittany house just behind the hedge. Even more so, when you consider the straight upright of the flag pole in the garden. The fruit trees in the orchard march neatly down the field in obediently productive lines. Amongst all of this tidiness and order, the wild flowers display a delightful touch of nature’s rebellion against the order of the man-made world – creating their very own Belle Île Orchard art, at least during the summer months. I now have a head full of other images that need to be painted so I’m off to the studio for a short evening painting session. I may come out for supper.